To get to the Hotel Balmoral in Benalmadena. Follow the N-340 road until you arrive in the centre of Benalmadena-Costa where you will easily find directions to reach the hotel in Benalmadena. The taxi rank is located just outside the airport. The cost is between € 25 and € 35 per way. There may be a supplement for luggage, holidays and night services. It is located a few meters from the airport. Take the train to Fuengirola, which runs every 30 minutes. The station where you will have to get off to get to the hotel is Arroyo de la Miel. The journey is 20 minutes and the price of the ticket is 2.50 € per person approximately. From the center of Arroyo de la Miel, take the bus nr 103 that will leave you at Avenida de las Palmeras, which is located on the street parallel to the hotel. By the motorway A7, taking exit 222 Benalmádena - Arroyo de la Miel. Turn left next to the Galp gas station, and continue straight ahead down towards the beach. When you reach a roundabout with windmills, turn right and continue straight ahead. A few meters to the right you can see the hotel. Turn right again at the next roundabout to reach the entrance. All rooms have two single beds, individual air-conditioning units telephone, satellite TV, full bathroom, private exterior balcony, optional safety deposit box and the possibility of including a cot. These rooms at the Hotel Balmoral in Benalmadena, occupy the western part of the building They enjoy magnificent views of the pool and garden, as well as a side view onto the sea. All rooms have a balcony. All are exterior-facing and have two single beds, room safes, air conditioning, heating, telephone, satellite TV, fully equipped bathrooms and private balconies to make your stay as comfortable as you would wish. 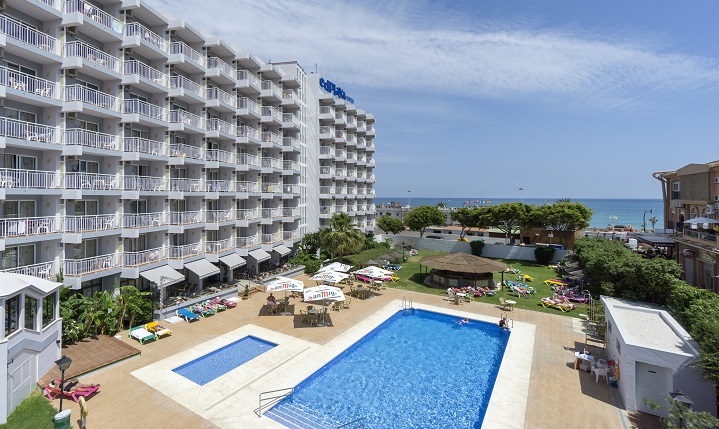 The Hotel Balmoral is located in Benalmádena on the Costa del Sol, just 50 metres from the beach and a short distance away from the Port of Benalmádena , which is a fantastic complex of bars, shops and restaurants surrounding the marina. Nearby is also the Paloma Park which is a wonderful green large park ideal for strolling through or relaxing in the lovely climate of the Costa del Sol. The hotel is ideal for both families , friends and couples, and has rooms distributed over 7 floors, with the vast majority of the rooms having excellent views of the Mediterranean sea. The Hotel Balmoral has two swimming pools, one for children and the other for adults. The attractive swimming pool area has sun beds for guests along with tables with umbrellas for relaxing by the pool and enjoying the bar service available. Free Wi-Fi is available in the rooms and public areas of the hotel. The hotel´s restaurant offers buffet style dining with a wide range of regional, Spanish and international dishes. There is also an entertainment team on hand to make sure adults and children alike can join in the fun ! Benalmádena is in the heart of the Costa del Sol and is a very popular resort for holidaymakers due to its beaches , shops, restaurants, and access to all the wonderful attractions of the south of Spain. • Guide dogs are allowed. • Disabled rooms on request, subject to availability. • Easy access for the disabled to the main floors. · Table-tennis table, billiards, tennis court , and darts. · Daily entertainment activities for adults and children in the pool/garden area (summer), or in the indoor lounges (winter). Evening entertainment with performances by artists (magic shows, flamenco) and dancing. ·MedKids Entertainment Programme High Season; outdoor and indoor children activities for children from 4 to 12 years old. • Hotel with views of the sea. • 24 hour concierge service. • Taxi service, free to call. • Bus stop close to the hotel. • 24 hour security service. The dining service is buffet-style. Here you will find a great variety of dishes of Mediterranean and continental cuisine to choose from. • 210 rooms arranged over seven floors. • Welcome toiletries in the bathroom. • Safe box (fees apply). The Hotel Balmoral has a small private parking area at the side of the hotel. There are a limited number of spaces available and therefore we are unable to take forward reservations for the parking spaces. Parking can be paid for on arrival at the hotel when checking in, if there are places available. The price for a parking space is from 5-10€ per day dependent on the month of the year. · Dining room overlooking the pool.